The 1st Centurion, Quilius Correlius, lead the procession route out of Jerusalem by way of the Gate of Struenus, wending its way down through the valley to the hill of Calvary, commonly known as Golgotha; the barren skull-shaped hill used by the Romans for execution. Yeshu’a and the two thieves passed along a line of weeping women, amongst them was his mother with his sisters and brothers, and a small group of close disciples and followers. All were in great distress upon seeing the wounds Yeshu’a had undergone from the scourging, and seeing him bleeding profusely. His weakened state made it impossible to drag the heavy cross. He fell to the ground on several occasions when a kindly figure stepped from the crowd to assist him in carrying the heavy cross. 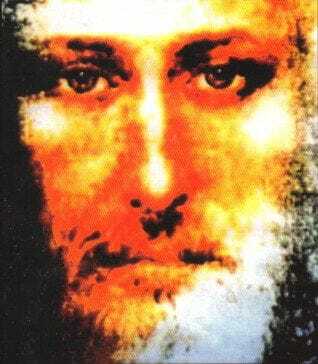 Yeshu’a’ bloodied face looked up into the face of his old Bedouin friend, Yusuf. A whisper of a smile came over Yeshu’a’ lips upon seeing his old friend again. Yusuf was appalled at what he saw, choking back tears as he witnessed Yeshu’a condition, and took the weight of the cross upon himself for the final stage to the hilltop. Because of the hard rock surface, it was impossible to dig a sufficiently deep hole for the crosses to be placed into, so the Romans had constructed a large trellis-like structure atop of the hill, upon which crosses would hang on stout iron nails through a hole on the top of the crosses. Many crosses would hang upon this structure. Some corpses were left there in a state of foul decay, before they were eventually thrown to wild animals. The more ‘fortunate’ corpses would be bartered back by relatives from Pilate, for removal and burial. Pilate made a nice private income from this grizzly business. About this time crowds came out from the city, some drawn by curiosity. Amongst them were priests, and some of the stallholders who had been the source of Yeshu’a wrath at the Temple. All gloated and jeered with satisfaction over the vengeance they had secured, and they encouraged others to do likewise. It was at this time, and unseen by those present, that the black sleek form of the raven that had followed Yeshu’a all those long years through Bharath and back, flapped and steadied itself upon a pole nearby. The heat of the day increased, but by mid-afternoon the sky darkened and the earth trembled as a violent earthquake rumbled beneath the feet of the crowd of mockers, scattering them as they rushed to the shelter of the city. Murree and her family, ignoring the violent movement of the ground, sheltered instead beneath the cross. A thick, reddish fog began to slowly creep over the landscape. Standing quietly some distance from the scene stood the Roman Commander, Corsini. It dawned upon him that Yeshu’a was beloved of the gods as he fixed his gaze upon the pathetic figure of Yeshu’a impaled upon the Roman wooden cross. At this point the black form of the raven flapped its wings and at the wink of an eye changed into a pure white dove, and rose from its resting place and flew high into the gathering clouds. The earthquake’s violence split open many sepulchres, exposing the remains therein, but the crowd, in their haste, assumed that the dead had risen in angry opposition to the cruel injustice meted out to an innocent man, and they ran through the streets of Jerusalem proclaiming this fearful fact. Small groups huddled together for comfort and courage, as a strong wind blew all before it, swirling the red dust through the narrow streets, overturning merchant’s stalls, as it careered on its way to Pilate’s palace, on a trail of vengeance, ripping through the heavy wine-coloured drapes that hung on either side of the balcony, and spreading a thick layer of red dust on the white marble floors. Pilate moved his two visitors away from the balcony and into a side room that sheltered them against the violent wind. Joseph and Nicodemus came to secure the release of Yeshu’a’ body from the site of crucifixion, that they would lay it rest in Joseph’s tomb. As already stated, it was common practice by relatives, to barter with Pilate for the return of the bodies, but in this instance Pilate hesitated making such a heinous request of the two most prominent members of the Sanhedrin. “I need to be sure, you understand, that the criminal is in fact dead, before he is removed,” Pilate said, instructing his secretary to send his Centurion, Longinus by name, to proceed immediately to Golgotha, to ascertain that Yeshu’a was indeed dead. Joseph and Nicodemus hurried to the site on foot while the soldier galloped swiftly ahead. On their arrival they gasped upon seeing the wretched body of Yeshu’a hanging limply upon the cross, while the centurion stood nearby with the bloodied spear that pierced their Master’s side, just above the hip. “We have Pilate’s permission to remove the body,” Joseph announced to the centurion, who in turn curtly replied that he had no such orders, and his duty was to first report to Pilate. An argument ensued, whereupon Corsini strode forward and commanded the centurion to do as they requested, that He would take full responsibility. Many hands laboured to remove the heavy cross from the stout nail from which it hung, gently laying it at the feet of a heartbroken Muree.